This 4-pack of outdoor solar lights from Ecothink are a practical and aesthetic fitting for any home or office. With high quality LEDs providing almost 50,000 hours of light, these battery-operated units emit 5 lumens from each of the 6 LEDs. With a waterproof level of IP44, they are suitable for usage on stairs and the patio. With all hardware for mounting included, you can finally be free from ugly and messy wiring. 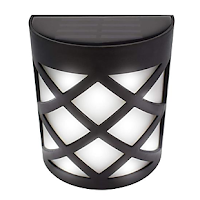 Install this simple yet stylish addition to you outdoors and you'll thank us later.